rejected twice by the National Assembly, the Presidency has said he would remain as the head of the anti-graft agency. This was made known by the Governor of Kaduna State, Nasir El-Rufai, who represented Acting President Yemi Osinbajo at the commissioning of the EFCC zonal office in the state. Governor El-Rufai, quoting the Acting President said President Muhammdu Buhari has confidence in Magu’s capacity to lead the anti-corruption war in the country. “We have confidence in Magu to fight corruption to a standstill. He will remain the EFCC chairman as long as I remain the acting president and as long as Muhammadu Buhari remains the president,” he said. 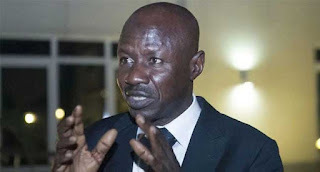 Despite the setback he has suffered since he was first rejected by the Senate on December 15, 2016, the acting EFCC chairman said he remained committed to the war against corruption in the country. To this end, he called for the cooperation of all Nigerians in the fight against corruption which, according to him, is largely responsible for the socioeconomic and security challenges in the country. After the commissioning ceremony, the anti-graft agency held an interactive stakeholders’ forum where some of them stressed that the fight against corruption is bigger than an individual or institution, hence all hands must be on deck to conquer the monster. A member of the Presidential Advisory Committee Against Corruption, Professor Femi Odekunle, who believes that the nation is making progress in its anti-graft war, blamed the judiciary for the loss of some of the high profile corruption cases at the courts.